Learn to use your Sub-conscious Mind to achieve your Goals, Health, Wealth, Happiness, Improve relationships and Self-confidence. Ever wondered life would have been very different if you could pursue something of your own. 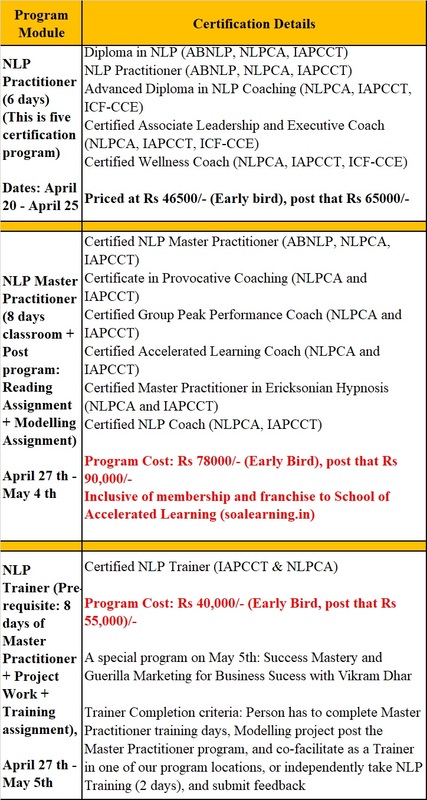 If you would like to be a Transformational Coach, or an NLP Trainer here is your chance to attend 15 days of Transformational NLP and Coaching Boot camp (Certified NLP Trainer Certification in India), which will speed up your career move towards this. There is going to be lots of learning, and guidance to set up your own business. This is the only certified nlp trainer certification in india, which focuses on Business Skills along with NLP and Coaching concepts where you will learn how to set up your website, Digital Branding, Social Media Marketing, Search engine optimization of website, and Business Growth Hacking. Program is split into different modules (Certified NLP Practitioner, Certified NLP Master Practitioner, Certified NLP Trainer, Coach Certificates, Hypnosis Practitioner and Master Practitioner), providing flexibility in choosing what certificates a participant wants. The certificates are optional for each program, providing more flexibility in choosing the right certificate as per the outcome. Our program leads to ICF approved certificates under CCE hours category for Core Competency and Resource Development. Certified Wellness Coach, and Certified Associate Leadership and Executive Coach. As part of this program you will do a NLP Modelling Project (with three people that you want to model) on a topic of your choice â€“ result that you are seeking for yourself. Change your own limiting meta-programs: If you have a way of processing the world thatâ€™s limiting your success, find a way to consciously adapt. You will explore identifying your own meta-programs during the program, and changing them in ways that will benefit you. A. Duration of Training: Minimum of 130 hours of advanced training through Practitioner and Master Practitioner Level. Completion of Modelling project with minimum of 3 exemplars (Person whom you are going to model for a particular skill or behavior). 1. Demonstrate complete competence in all Practitioner and Master Practitioner level skills, ability to do any and all practitioner and master practitioner techniques simultaneously both overtly and covertly. 2. Demonstrate capability to shift between content and experience to engage participants. 3. Ability to be flexible in design of experience, and demonstrate what one is teaching and to teach what one is practicing. a. Rapport Building Skills with the audience. participantâ€™s map of the world, at a conscious and unconscious level. c. Ability to answer questions, by managing your State as a Trainer. content and experience, balancing self-discovery time of participants, keeping track of time. g. Use of stories to create engaging sessions, and ability to work at un-conscious level. group, while keeping up with his/her values and outcome for the group participants. 5. Demonstration of a personal style, and charisma; incorporating new techniques, new methodologies, and integrating those skills into his/her own behavior. 6. Demonstration of deep understanding of the process of NLP Practitioner and Master Practitioner level. You can co-facilitate with our already existing NLP Trainers/Coaches during our regular programs, and complete supervisory hours, and receive feedback about your progress. You will be required to present 2 times (Once in three different programs), and post that you will be elevated to full Certified NLP Trainer level. Our association has working members from US, UK, Dubai, Canada, Kuwait, Myanmar, Australia, and India.